Profits are his pleasure. Philanthropy is his purpose. 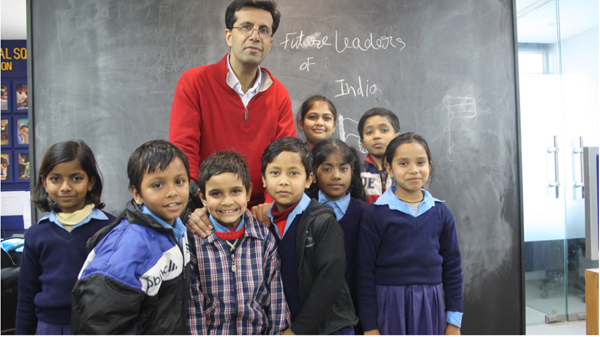 Ashish Dhawan, Founder and Chairman of Central Square Foundation, moved on from a lucrative career in private equity in June 2012, to make India’s primary and secondary schooling system more equitable. It was also a shot at a second career that he had long wanted. The education sector proved to be a catalyst for his entrepreneurial spirit, which aspired to strengthen India’s academic portfolio by ensuring that children received high quality education. Through grants, research and advocacy, his organisation focuses on achieving those goals. Benjamin Franklin’s autobiography is one of Dhawan’s favourite reads. The impressive different careers Franklin embraced inspired Dhawan. “We tend to box ourselves in too much and overbudget our needs. These are the reasons why we’re unsuccessful in exploring different facets of life for ourselves,” he says. Challenging the status quo in education seemed a battle worth fighting to the Yale and Harvard-educated Dhawan. He saw the lack of initiative in the primary education domain as detrimental to society and the economy. “India’s growth will come to a staggering halt in 2025 if we are unable to secure our children with consistent and good quality education,” he says. The government system is better at the infrastructure level but not good in terms of leadership and staff. “How do we hire better teachers, how do we train them, how should performance be managed, how should school leaders be selected and how should technology be leveraged, are some of the many crucial questions we will need to answer soon,” he says. Teaching had always excited Dhawan. However, he didn’t have the qualifications of an educator. But he had a heart of an educationalist. His mother vehemently discouraged the idea. “You’ll become a jhola-carrying teacher all your life and lead a financially unrewarding existence,” she had said. So he took the traditional corporate path and did well for himself. Some years later, he was in a financial position to take the leap of faith. “My first job was at the Wall Street and I was enamoured by it. I was soon disillusioned with it too. It struck me that it turned people into a****les. Money goes to your head fast and you start thinking of yourself as the master of the universe,” he says, admitting he is glad to have got out because his judgement told him he didn’t want to work with people he didn’t respect. The years have matured Dhawan. He remains focused on his vision of reducing the education crisis. “I have a great education and a superb family. What can go wrong? Not much. If this doesn’t work out in the long run, someone will surely give me a job,” he says. For now, he is happily transforming his dream into reality, giving children hope for holistic learning.